High Quality, Low Cost Monitor in 15" and 17"
Great monitor. Going to order a 2nd. 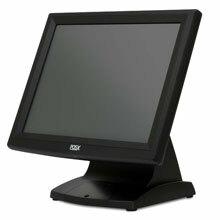 Use in retail Point of Sale. Works great with Windows 7 64 bit which is why we replaced prevous monitor that did not work with Windows 7 64bit. Drivers a bit clunky to install but work well. Tapping screen will wake up PC when idle. The POS-X ION-TM2B is also known as POSX	PXI-ION-TM2B	or IONTM2B	.